You are here: Home / Spend Smarter / Nectar Mattress Review – Is Buying A Mattress Online A Good Idea? My wife and I have had our old mattress for a few years. Unfortunately, the old mattress has slowly gotten worse and worse. We both end up rolling to the middle of our bed which doesn’t equate for a good night’s sleep for either of us. So, we decided to start shopping for a new mattress. During the process, I was inundated with advertisements to buy mattresses online. I have to admit, I was a bit skeptical. Why would anyone buy a mattress they can’t test out before they buy it? After doing some investigation, I found out buying a mattress online is honestly pretty risk free. Most major mattress companies offer at least a 30 to 100 night “free trial”. For most companies, you can return the mattress for absolutely any reason during the trial, no questions asked, and get a full refund of your purchase price. With that in mind, I read quite a few reviews and decided to try out an online mattress. Now, here’s what you need to know about this review before we get started. While we were going to purchase a mattress online ourselves, I first reached out to Nectar to see if they’d be willing to give me a free mattress in exchange for a review on the blog. Nectar agreed and sent me a free King size mattress and two free pillows to test out and keep. While getting a free mattress is awesome, I made sure to stress to Nectar that my review wouldn’t be a sugarcoated “everything is awesome” review if the mattress stunk. That said, all they asked for was a 100% honest review. That’s exactly what this review is. Interested in buying a Nectar Mattress? You can support our site by buying through this link. You’ll get $125 off any size mattress and two free Nectar pillows. A few days after being notified of our mattress shipping, we received our Nectar Mattress through FedEx. I actually saw the delivery driver pull up to our house. Instead of pulling up in the road, he actually backed into our driveway because the mattress was over 80 lbs. I spoke with the driver and he mentioned he was delivering 4 other online mattresses that day to our small city, so the popularity of online mattress purchases is quickly rising. The Nectar mattress arrived rolled up in a thick cover secured by a drawstring and tape. The packaging was in great shape with no tears at all, although it was a little bit dirty as you’d expect with any package that traveled for six days across the country from Washington state to Florida. 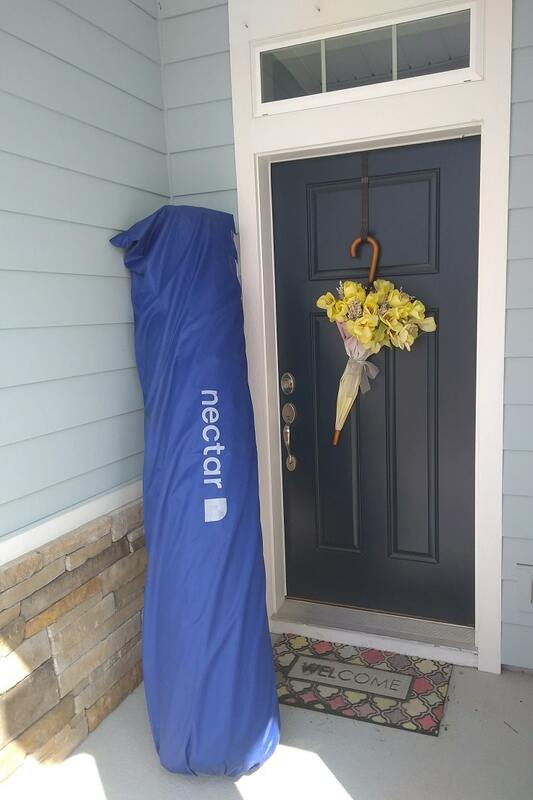 After taking pictures of our Nectar mattress on our front porch, my wife and I carried it into our master bedroom. I definitely suggest having someone help you move the package as it is over 80 pounds. It’s a much easier task as a two person job. What I didn’t realize was that the outer covering was just for shipping. After removing the outer covering, we found another covering that actually had a strap to make transporting it easier. I wish we had known this prior to moving it into our bedroom as it would have made moving it much easier. After removing the second covering with the handle, we saw our heavy duty shrink wrapped mattress. We also found a small package that had some paperwork and a very handy letter opener tool that should be used to open the shrink wrap. We put our shrink wrapped mattress on our box springs, unrolled it, then used the letter opener tool to very carefully open the shrink wrapped package. If you get a Nectar mattress, make sure you do not accidentally cut the mattress fabric when opening the package. Instead, look for the side with the largest plastic area and cut there to avoid any damage to the Nectar mattress. Once we started opening the shrink wrapped package, the Nectar mattress started rapidly expanding. Within a couple minutes, the mattress seemed like it was at full size. However, it technically can take 24 to 72 hours to completely expand. While we aren’t mattress experts, we do know what we like in a mattress. Personally, I like a mattress that is a bit firmer. I don’t know why, but I just sleep better on them. My wife prefers a mattress on the softer side so her body can sink into it just right. Usually, that means it is a major pain whenever we go mattress shopping. We weren’t sure how the Nectar mattress would work out for us, but we thought we’d give it a shot. As soon as we had the mattress unpackaged, we laid on our new Nectar mattress. 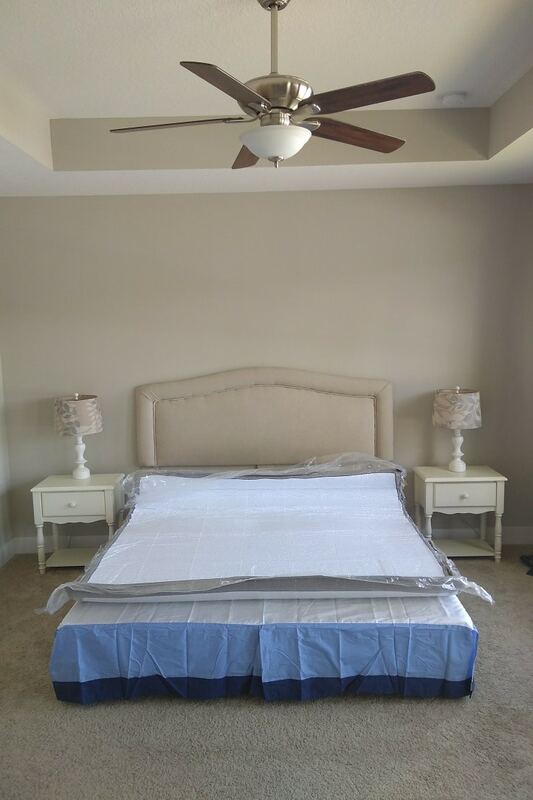 Our first thought was that it was a much firmer mattress than our previous mattress, but it had plenty of give where it needed to give to allow us to lay comfortably on the bed. We did notice a very apparent odor when we opened the package which Nectar said is just a new foam smell. While the smell didn’t bother us, it did fill up the room once the package was opened. If you’re sensitive to smells, I suggest opening the mattress in a room you don’t have to sleep in and let it air out before moving it to your bedroom. A few hours later it was time to test our first night on the Nectar mattress. Our first night was an adjustment, but overall was very good. It takes time for your body to adjust to something new, but we both slept better on the Nectar mattress than we would have on our old mattress. In a shocking discovery, both my wife and I stayed on our side of the bed all night. There was no rolling to the middle which was amazing for our quality of sleep. 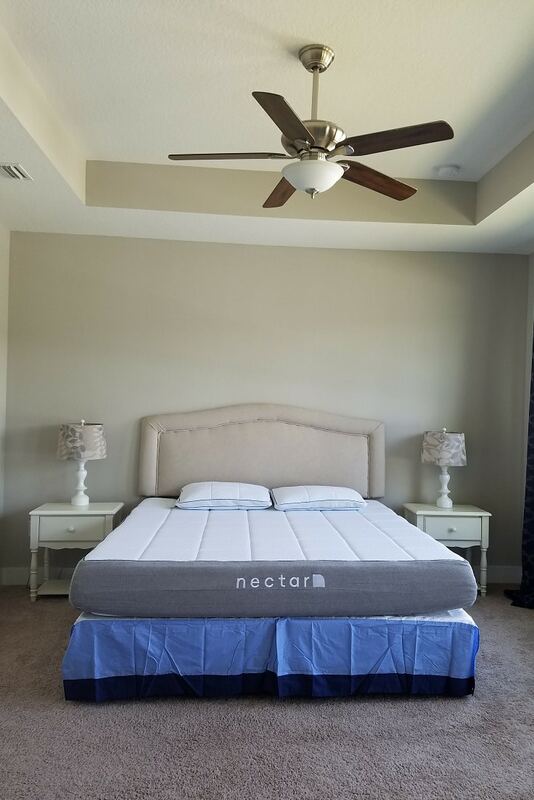 Neither of us woke up with any pains like we occasionally would on our old mattress, so our initial thoughts after the first night was that the Nectar mattress was a winner. Of course, one night doesn’t tell the whole story. You really need at least a few days before making any conclusions to let your body fully adjust to the new mattress. As far as the new foam smell goes, the smell was still apparent the first night, but much less strong than when we opened the package. After a couple days, the smell was completely gone in the room although you could still smell it if you shoved your face in the mattress and inhaled. The smell was completely gone in about a week. I’ll share our 30 day+ view of the mattress after a bit of information about the Nectar mattress and why we chose it. The Nectar mattress is an 11 inch foam mattress with multiple layers designed to give you an awesome night’s sleep. The mattress has five layers designed to provide support, distribute weight, contour to your body and keep you cool which is often a problem with foam mattresses. I was particularly surprised that the Nectar mattress never felt hot. My wife is usually a warm sleeper and said the Nectar mattress kept her plenty cool. 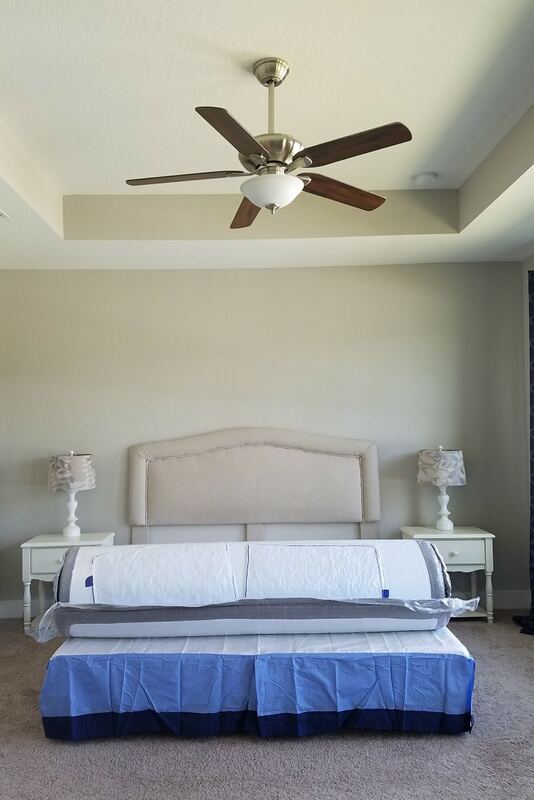 While we haven’t gotten into the heat of Florida summers yet, our AC is at it’s highest temperature we set it to (75 degrees), so we feel like we have a good idea of the mattress’s temperature. A tencel cooling cover, quilted gel memory foam and a breathable base layer help to circulate air and keep you cool. Additionally, the mattress has a cover that is removable and washable should you need to wash it. However, we bought a waterproof breathable cover on Amazon to prevent the need of washing the Nectar cover. If you’ve been mattress shopping lately, you know mattress stores place a premium on their products. After all, they only sell mattresses, so they have to make a decent amount of money on each sale to stay in business. That’s why I believe buying a mattress online is a great opportunity to save money. Buying online cuts out all of the middle men and layers of additional cost that you have to pay when you buy a mattress in a mattress store. When you buy a mattress online, you don’t have to pay the distributor, the mattress salesmen, the store rent or other overhead costs traditional mattress stores build into their costs. Instead, you get a much lower price point on a superior mattress product. What makes online mattress purchases even better is the 100% money back guarantee most mattress brands offer. In particular, Nectar offers a 365 day money back guarantee which is one of the best in the industry. I believe having a full year to evaluate the mattress is key, especially if you live in a climate with hot summers. This way, you can make sure you don’t think the mattress gets too hot in the summer. You also get to make sure the mattress holds up to your standards and your body continues to love the mattress after 365 days. I purposely waited to publish this review until we’ve slept on the Nectar mattress for over a month. Our mattress was delivered in March and despite being away from home for a few nights during that time, we’ve slept on the Nectar mattress for over 45 days now. As with any change, after a few nights of sleeping on the Nectar mattress I was no longer surprised to get into bed and feel a very different mattress. In fact, I now look forward to the feel of the Nectar mattress. My wife agrees. Even though the bed is firmer than she thought she’d like, the bed contours around her body just right so she no longer wakes up with weird aches and pains. 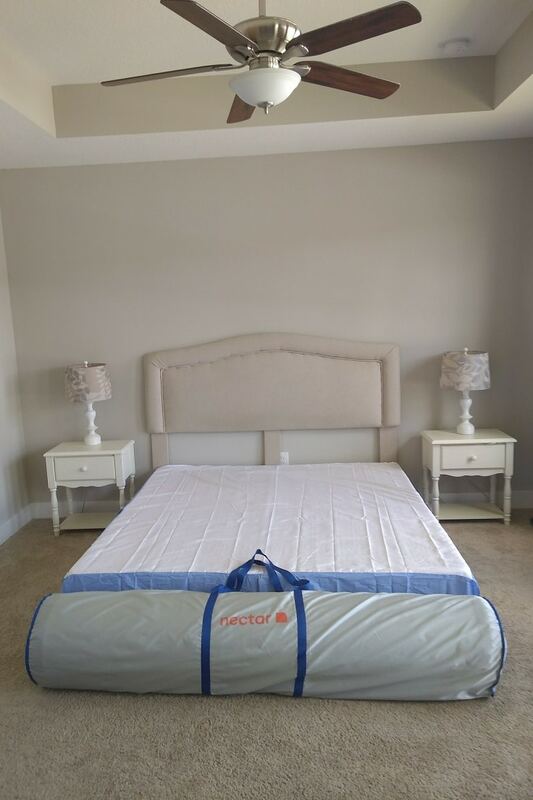 We were so comfortable with the Nectar mattress that we sold our old mattress a couple weeks ago. There’s no turning back now. I’ll continue to update this post and share any new thoughts as we sleep on the Nectar mattress longer, especially if there are any negative changes. However, if there isn’t an update, it’s because we still love our Nectar mattress. Nectar says that their mattress should work fine on the floor, on a bed frame, on box springs or on a foundation. Personally, we had box springs from our previous bed so we just reused those and it has worked just fine for us. Another selling point of Nectar is their forever warranty. Nectar says that their mattress should be the only mattress you should ever need and should outlast you. While I have no clue how long the mattress will actually last, I took a look at their warranty fine print and it has a lot of the common exclusions many mattresses do. Impressions have to be over a certain depth in order to qualify for a warranty claim and then there is a process you have to go through to work on getting a new mattress. If this is a sticking point for you, make sure to read the detailed warranty information on Nectar’s website. Even though I liked our Nectar mattress, I had to wonder what would happen if we didn’t like the mattress so I reached out and asked. My contact at Nectar said they would arrange for mattress pick-up by FedEx and then process a refund the same day the mattress is picked up. While researching the Nectar mattress, I came across quite a few bad reviews that had nothing to do with the mattress. Nectar has grown in popularity so much that the demand had outstripped the supply for a bit, causing backorders. In fact, it looks like Nectar’s shipping department is a couple days behind as I write this. To see how quickly your mattress will ship, head over to the Nectar mattress order page and look right under the add to cart button for an expected ship date. If you don’t get notification that your mattress has shipped within a day or two of that date, call them up and ask them to look into it. That said, I think Nectar offers one of the better price points in the market for a quality product, so waiting a few extra days for your mattress is worth it in the big scheme of things. However, if you need a mattress by a certain date, make sure you give yourself plenty of time and order ahead to make sure you’ll get your mattress in time. Also, a mattress isn’t something you’d get on Amazon Prime, so don’t expect two day shipping. It took six days for our mattress to cross the country, which was actually a couple days ahead of schedule according to FedEx’s original estimate. 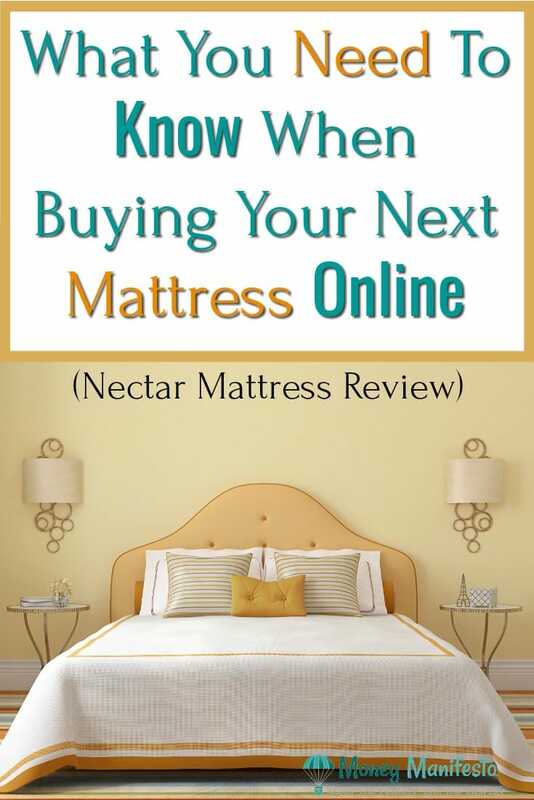 Buying a Nectar mattress online is a smart money move in our books. You get a quality product, a 365 in home sleep trial and a forever warranty for your purchase. If you don’t like it, have them come pick it up and get your money back. You really have nothing to lose other than the time it takes to set up the mattress and try it out. What questions do you have about buying a mattress online or about the Nectar mattress in particular? I’d be happy to answer any questions you may have in the comments below.